Off World Designs is the official merchandise vendor for Westercon 64 and will have a Sales to Members table at Westercon 64. 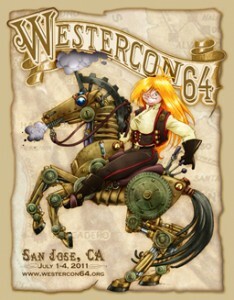 Pre-convention, they are selling this official Westercon t-shirt designed by Phil & Kaja Foglio. Previously only available at our staffed fan tables at other conventions, now you can order yours for $20. Click on the t-shirt image or here to go to OffWorld’s web site and order yours.